I’m delighted to announce that as of this week we’ve hit 800 sponsors for 2015, a full 500 over the number that we needed to remain open. When the San Francisco bookstore announced it could not survive after the city passed a new minimum wage law, a meeting of customers came up with a plan that assured the store would stay in business if 300 people bought sponsorships for $100 apiece. Within 48 hours they had the minimum. Many more have signed up since. What will be done with the additional funds? 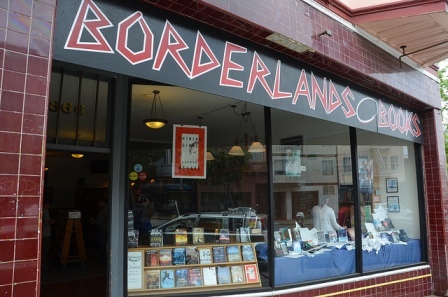 Borderlands Books has already given the employees a bonus and a pay raise based on the minimum wage increase. Repairs and infrastructure improvements will be made. And the outpouring of support has inspired a dream of creating a nonprofit organization in order to buy a building that will provide the business with a permanent home and guarantee it will be around for a very long time. Regardless of the geographic area, lease expirations and increased rents are one of the most common reasons for the closure of established, stable businesses. In a city like San Francisco, with its constant cycle between boom-town and bust, that is even more true. Right now our leases are in good shape and we have excellent relations with our landlord. But that is not something to count on ten, twenty or fifty years from now. With the success of the sponsorship program, that is the time-scale I’m looking at — 50 years. This entry was posted in Like Show Business and tagged Borderlands Books by Mike Glyer. Bookmark the permalink. Too true. One my favorite restaurants in Sherman Oaks, CA, which has been there since before I was born and does excellent business, is being forced to close next month because its shopping center was bought by a new owner who increased its rent to more than it can afford as soon as its old lease expired. I am delighted to hear this, and prepared to buy my membership next year — as soon as they hit the goal, that became the plan to make sure that they didn’t have a one-year boom then bust. Invest these funds, wait for a real estate drop, buy. Real estate drop in San Francisco? If that happens, something is wrong on a global scale. I fully intend to re-up memberships next year. One for each member of our household.